You are here: Home / Uncategorized / Fear of the Lord: How Should We Think? 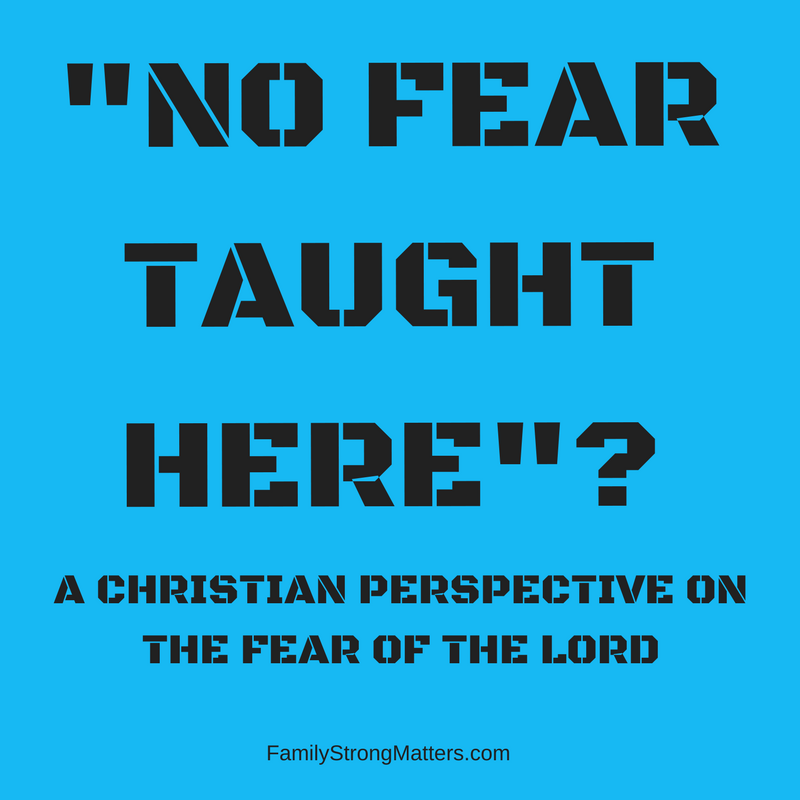 As a father and husband trying to lead his family, what does it mean to fear the Lord? To fear the Lord may sound archaic and perhaps unimportant. After all, don’t we just want our children to love God…and not fear Him? For a healthy family, the fear of the Lord is essential. To fear the Lord according to the Bible has multiple meanings depending on the context. And the Scripture context I have in mind is Acts 9.
had peace and was being built up. The fear of the Lord here has the meaning of honoring and revering God. It is one of respect, not wanting to displease. It is the fear that a faithful son has for his father. In fact, the fear of the Lord has priority in life. Regarding the often quoted passage, Proverbs 1:7, the fear of the Lord is the beginning of knowledge. In other words, to have knowledge and wisdom in the Christian life, the key thing is first to honor and revere the Lord as Creator and Redeemer. How do we lead in the fear of the Lord? So, an important question is this. How do we as fathers intentionally lead our families in the fear of the Lord? A good place to start is with ourselves, fathers. Fathers, we begin with ourselves. As I think back on my childhood home, I recall various memories of my father. One of them is of him in a dimly lit living room reading the Bible and devotional material each morning. The expression, “better caught than taught,” may apply here. To be sure, we are to teach our children verbally why we should fear Him and what it means. But the lasting impression, by God’s grace, is often what is practiced in the home. As a pastor and father, I know how to explain what it means to fear the Lord. But do I live this out? Do my children observe this in my actions and words? Would my wife agree that I fear the Lord as I guide the family? If you haven’t read the story of John Paton , missionary to the cannibals in the South Pacific islands, I encourage you to read about his home growing up. Pastor Joel Beeke quotes John Paton’s experience with his father who feared the Lord. [http://www.reformedfellowship.net/how-to-do-family-worship]. What was caught and taught in John’s experience is powerful. How do we as fathers lead in the fear of the Lord for the sake of the next generation? We lead by example. Even if our children were all deaf, they should be able to picture this Christian life in us. Our goal should be that we are confessing and repenting of sin and honoring God in our every movement. In the book, Parenting: 14 Gospel Principles That Can Radically Change Your Family, by Paul David Tripp, he reminds us how we are all (i.e. parents and children) worshipers of God, either the true one or a false one. We are either going to fear the Lord or fear someone else or thing that is demanding reverence. And so Tripp’s point here is that we as fathers need to be less self-righteous and more compassionate with our children. And by application, I think this includes when our children don’t fear the Lord as we expect. Tripp writes: “You see, it really is true and worth repeating that no one gives grace better and more willingly than a person who has admitted that he desperately needs it himself”. Our leadership in demonstrating the fear of the Lord and the grace needed when we fail begins with us as fathers. This is why we need Jesus. It’s is why we need the Spirit of the Lord to lead us. We need this same Spirit of the Lord as prophesied in Isaiah 11:2 and that came upon Jesus the Messiah. With this same Spirit of the Lord in our own lives, we will also have the right fear of the Lord. the Spirit of knowledge and the fear of the LORD. Isaiah 11:2 (ESV). How do you communicate this idea of the fear of the Lord in your homes? What are the stumbling blocks that keep you from fearing the Lord? We only encourage you to buy what we think may be good for you. See all of our other recommended resources.